One Lucky Family Will Win a Trip to NYC and Meet The Story Pirates and Absolutely Mindy from SiriusXM Satellite Radio's Kids Place Live on October 5th. Every sweepstakes entrant receives a music download featuring 17 tunes from this season's artists. Sweepstakes entry ends on August 21. Grand Prize: A weekend in New York City, October 4-6: including transportation, hotel, meals and tickets to see Story Pirates perform at Symphony Space on Saturday, October 5. The winning family will also get to meet Absolutely Mindy from SiriusXM Satellite Radio, and see their child's story acted on the New York stage. Second Prize: Five winners will receive a library of CDs from every musical artist performing at Just Kidding this season, plus new children’s books from Symphony Space’s Thalia Kids’ Book Club. Everybody Wins! All entrants will receive a link to download 17 songs from this season’s Just Kidding performers, all top artists in the national family music scene. Entries in the No Kidding? Just Kidding! sweepstakes must be received by August 21, 2013 at 9 pm EST. The winners will be determined via random drawings. The sweepstakes is open to anyone in the continental United States, except where prohibited. Other restrictions may apply. No purchase is necessary to enter. Partners in the No Kidding? Just Kidding! sweepstakes include Hotel Newton, Kidville, Parents Magazine, Big Daddy’s and Two Boots restaurants. 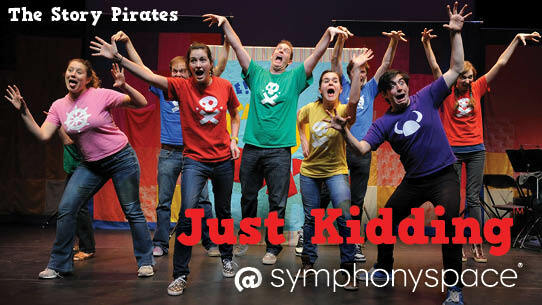 Join the conversation with Just Kidding on Facebook and Twitter.